The new force, set up in late 2015, is not part of army, navy, air force, or missile force and is directly under the Communist Party's Central Military Commission, according to a report published this week by the National Defense University. The force has combined several People's Liberation Army (PLA) advanced warfare and intelligence capabilities into a single unit for the first time, although much of the unit remains shrouded under Chinese military secrecy. The NDU report is one of the first public studies by the Pentagon on China's use of combined space, cyber, information warfare capabilities and intelligence and espionage forces. Publication of the report coincides with recent State Department sanctions imposed on Gen. Li Shangfu, deputy commander of the Strategic Support Force. As director of the force's Equipment Development Department, Li and the department were hit with financial sanctions Sept. 20 for their role in purchasing Russian jets from a banned state arms exporter. The sale violated a recent U.S. law aimed at pressuring Moscow over its illegal annexation of Ukraine's Crimean Peninsula. The sanctions set off a series of retaliatory actions by the Chinese military including the canceling of U.S.-China military talks, the recall of a visiting PLA admiral and scuttling of a planned visit to China by Defense Secretary Jim Mattis. The Chinese stepped up aggressive naval activities by confronting a Navy guided missile destroyer in the South China Sea and nearly colliding with the warship on Sunday. According to the 84-page report, co-authored by former National Security Agency China specialist John Costello and cyber security expert Joe McReynolds, the Strategic Support Force (SSF) was created to bring together China's disparate information warfare capabilities that Chinese leaders believe will be decisive in future conflict. "The PLA views cyber, electronic, and psychological warfare as interconnected subcomponents of information warfare writ large," says the report, "China’s Strategic Support Force: A Force for a New Era." "Understanding the primary strategic roles of the SSF is essential to understanding how China will practice information operations in a war or crisis." The creation of the force was part of a major realignment of the PLA that is building up its forces with asymmetric warfare capabilities designed to allow its weaker forces to defeat more capable adversaries like the United States. The report states that China is speeding up the shift of its military from land-based territorial defense to "extended power projection" in Asia and beyond. "As part of this transition, China’s leaders have expressed a growing desire to protect their country’s interests further afield in the ‘strategic frontiers' of space, cyberspace, and the far seas," the report said. The report also concludes that the new force moves the PLA close to the Mao Zedong-era concept of blurring the line between peace and war by conducting low-level information warfare constantly in pursuit of strategic objectives. 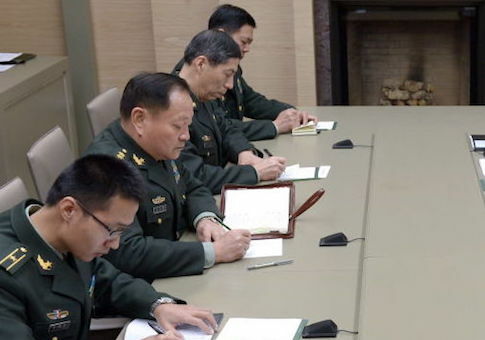 The force's commander is Gen. Gao Jin, who formerly headed the strategic missile forces and also was president of the Academy of Military Sciences – the PLA's hardline military research center. The two main subunits of the force are the Space Systems Department, that handles space warfare, and the Network Systems Department, that is in charge of both cyber and electronic warfare. The force also is said to be leading the PLA's efforts to combine artificial intelligence with large data sets for warfighting purposes. PLA cyber espionage groups, like the five PLA members indicted by the Justice Department for cyber espionage operations in 2014, were combined in the new force. 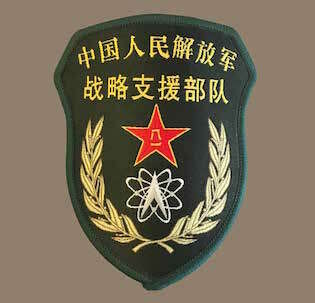 The main military cyber spy unit was the Third Department of the General Staff Department, known as 3PLA. That group and the electronic warfare group, known as 4PLA, are believed now to be part of the Network Systems Department. "Integrating the cyber warfare and [electronic warfare] elements of the former 3PLA and 4PLA is a crucial step toward fully realizing a long-held PLA theory of how best to fight information warfare known as integrated network and electronic warfare, which envisions the close coordination of cyber and electronic warfare forces in both capabilities development and operational use," the report said. In addition to space and cyber warfare, the new force also is in charge of political warfare and subsumed the PLA's 311 Base, also known as the Three Warfares Base – the name for China's information warfare doctrine that utilizes psychological warfare, public opinion warfare and legal warfare. "The 311 Base is the PLA’s sole organization that is publicly known to focus on psychological warfare," the report said. Chinese information warfare seeks "the power to control perceptions and shape narratives that advance Chinese interests and undermine those of an opponent," the report said. "The Strategic Support Force demonstrates China’s evolving understanding of how information serves as a strategic resource in warfare," the report concluded. "The PLA recognizes that harnessing outer space, the cyber domain, and the electromagnetic spectrum—and denying their use to adversaries—are paramount needs if the PLA is to attain superiority in a conflict." For regional power projection, the SSF is being used by the PLA in seeking to control the East and South China Seas by combining space-based surveillance, satellite relay and communications, tracking and navigation information. For a future conflict, "long-range precision strike, far seas naval deployments, long-range unmanned aerial vehicle reconnaissance, and strategic air operations all rely to varying degrees on infrastructure over which the SSF now wields exclusive control," the report said. By controlling space-based information, the SSF also will enable the Chinese navy's effort to operate further from China's coasts. The report said while the new force's role in anti-satellite missile operations, missile defense, and space-based kinetic operations is unclear, it will have a critical role in all those missions. The PLA may in the future declare the right to deny or degrade spy satellites aimed at its territory, a move that could bring it into conflict with the United States. The Pentagon has declared that any interference with critical U.S. satellites would lead to a forceful response.